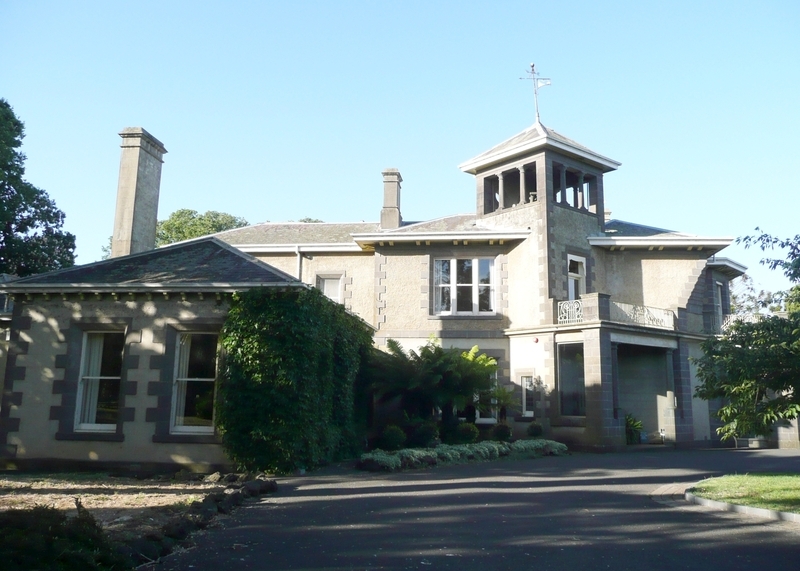 Glenormiston (Homestead and Former Agricultural College) including a two storey rendered homestead building and interior detailing of the lower and upper entrance hall, Robert Prenzel carved woodwork, an adjacent single storey outbuilding with curved roof, former overseer's cottage, former bluestone stables and adjacent two storey bluestone accommodation quarters, stone retaining walls including a ha-ha wall, an entry avenue of English Elms and avenues to the north and west of the homestead and various individual tree specimens. Other structures, including 1970s college buildings and the former Trufood factory building, also contribute to the significance of the place. 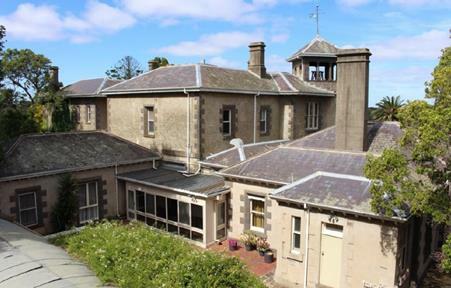 Glenormiston (Homestead and Former Agricultural College) was once part of an extensive run of over 17,000 hectares, initially known as Strathdownie when established in 1839. It was renamed Glenormiston in 1840 upon acquisition by Scottish pastoralist Niel Black on behalf of Scottish property investors, Niel Black & Company. The extant homestead was built as a five-roomed stone house in 1847 and was enlarged into a twenty-roomed house in 1859 by architects Austin and Company. After the dissolution of Niel Black & Co in 1869, partner Alexander Finlay acquired Glenormiston and his sons ran the property until 1889 when it was subdivided into 240 allotments. At this time Steuart Black, son of the original owner, acquired the homestead lot of 708 hectares. Further substantial additions were made to the homestead in 1908 in an Arts and Crafts style to designs by architects Sydney Smith & Ogg. This included the addition of a second storey and the execution of a decorative timber staircase in the new entry hall and bedroom furniture by woodcarver and cabinet maker, Robert Prenzel. A number of farm outbuildings were constructed at the property from the mid-nineteenth century onwards. The Glenormiston Butter and Cheese Factory was established in an existing woolshed in 1895 and operated on the property until relocation of the business in 1910. At this time the pioneering manufacture of powdered milk by the company Trufood Australia commenced at this site at Glenormiston. A new factory building was constructed for this purpose c.1920 and production continued until the factory was closed in 1974. 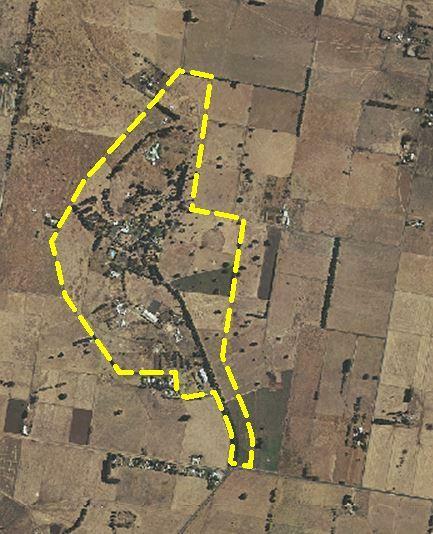 The 280 hectares of land, containing the Glenormiston homestead, was sold to the Victorian State Government in 1949 and the remaining land was sold as farms. The government-owned property became known as the Glenormiston Agricultural College in 1967 and was used as a research and educational centre. 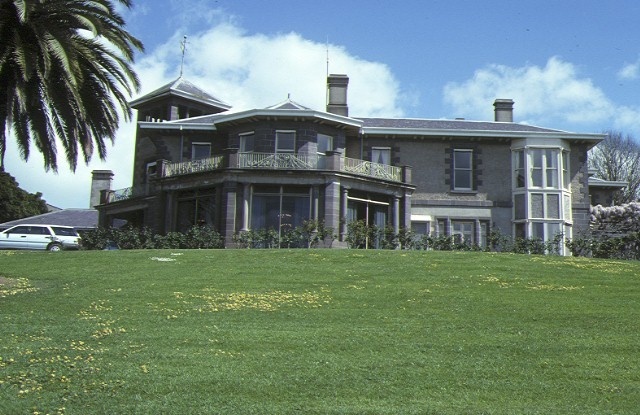 The homestead was renovated for use as an office, accommodation and teaching facility in 1970. A complex of teaching and accommodation buildings were added to the college in the 1970s and a number of outbuildings, including a stone coach house, stables, servants' quarters and shearers' quarters, were demolished. 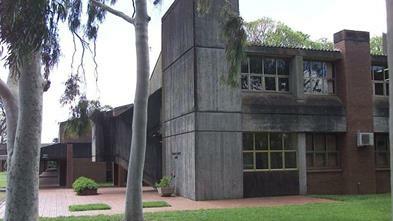 The college was officially opened in 1973 by the Premier of Victoria and finally closed in 2014. Another major phase of development at the site occurred during the 1990s with construction of an indoor equestrian centre, a group of dairy sheds to the east and Mullebar Koorie Centre. 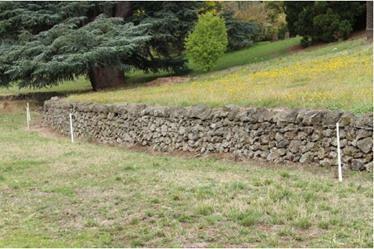 Glenormiston (Homestead and Former Agricultural College) is located north of Terang in Western Victoria. The property contains a large number of buildings including a two storey homestead, some extant surrounding outbuildings and later buildings constructed during its conversion to a research and teaching facility. Enlarged in a number of phases from the mid-nineteenth century, the extant homestead is a two storey rendered building in an Arts and Crafts style with entrance belvedere tower, two storey faceted bays, corner quoin work and Art Nouveau balustrading. The homestead contains an entry hall with decorative wood carved staircase by Robert Prenzel, timber panelling and original light fittings. 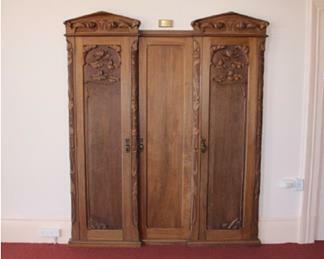 Decorative Prenzel-carved built-in wardrobe, free-standing wardrobe and folding screen are also contained in the homestead. In addition to the main residence, other extant nineteenth century structures include three bluestone buildings: a former overseer's cottage (designed by Alexander Hamilton in 1876), former stables and adjoining accommodation quarters; and a late nineteenth century rendered outbuilding with curved roof. Substantial gardens were planted during the nineteenth century, and remnants remain including a number of large and significant exotic trees. The driveway, with its avenue of some 190 English Elms (Ulmus procera), other elm avenues to the north and west, and stone retaining walls, including a ha-ha wall in front of the house, are notable features of the landscape. Other structures that remain at the site include: the former Trufood factory building (c.1920); a collection of sheds and outbuildings, erected from the 1950s onwards; and a number of brutalist-style campus buildings, built in brick, concrete and timber to the design of Public Works Department architect Desmond Bloink in the early 1970s. This place has significance for the Eastern Maar people. Glenormiston (Homestead and Former Agricultural College) is associated with the establishment of the township of Noorat, which followed the subdivision of the Glenormiston (1889) and Noorat holdings, and the establishment of the Glenormiston Butter Factory (1895). In addition, the development of the Trufood factory at Glenormiston for the manufacture of powdered milk from 1910 contributed to the diversification of commerce in the area. Glenormiston (Homestead and Former Agricultural College) also has significance as a site of research and agricultural education from 1949 until 2014, known as the Glenormiston Agricultural College from 1967. The group of former college buildings designed by the Public Works Department architect, Des Bloink, are remarkably intact and reflect a 1970s interest in brutalist architecture. The consolidation of Glenormiston's land holdings is associated with the violence directed by settlers towards Aboriginal people during the early expansion of the Western District frontier from the 1830s. All of the place shown hatched in Diagram 1611 encompassing all of Crown Allotment 2008 and part of Crown Allotment 2009, Parish of Glenormiston. Sydney Smith & Ogg Austin & Co.
Pastoral settlers began to arrive in the Lake Corangamite area from the mid-1830s, following Major Thomas Mitchell's exploration south of the Murray River in the previous year. By 1841 most of the available grazing land in the area had been taken up. Early interactions between the settlers at Strathdownie and the Aboriginal people were marked by violence. In 1836 the clan head of the Wada Wurrung Bulluk, Woolmudgin Curacoine, was murdered at an unknown location on Strathdownie Station (thought to be outside the area proposed for registration). A convict shepherd was charged with the murder, however there was speculation at the time that he had been encouraged by Taylor. In 1839 Frederick Taylor himself led a massacre (known as the Puuroyuup Gully Massacre) of 35-40 Aboriginal people near Mt Emu Creek in retaliation for the alleged theft of sheep from the station. Fearful of consequences, Taylor fled the district. Mt Emu Creek is located 6kms to the north east of Glenormiston. Violence towards Aborigines was used to consolidate settler land holdings. Glenormiston's origins, like many Western District homesteads, are intimately bound up with the violence that accompanied the early expansion of the Western District frontier from the 1830s. In early 1839, G McKillop and J Smith established the pastoral run known as Strathdownie (later Glenormiston) on Mt Emu Creek (originally known as Taylor's Creek), and the overseer of the property was Frederick Taylor. Taylor's house was built alongside Mt Emu Creek (located on a site about one mile east of the present homestead), and a contemporary description of the house reveals it was in the style of a 'Swiss cottage with a heavy overhanging roof' thatched with long grass and walls of wattle and daub construction. It contained a sitting room and two bedrooms with a detached kitchen. Other buildings at Strathdownie included workers huts of slab construction with thatched roofs and sod chimneys, a storehouse roofed with shingles, a woolshed/barn with a thatched roof and huts situated at the outstations. In early 1840 Strathdownie (around 17,000 hectares) was purchased for £773.17 by Niel Black, newly arrived from Scotland, on behalf of Niel Black & Company. The company's purpose was to invest in Australian pastoral ventures. The other partners were William Steuart of Glenormiston, Peeblesshire (Scotland); Thomas Steuart Gladstone, member of the Liverpool firm of Gladstone, Serjeantson and Co and Alexander Struthers Finlay of Toward Castle, Argyllshire. Black renamed the station Glenormiston. Born in 1804, Niel Black had gained a thorough knowledge of practical farming in Argyll and although Black initially contributed little capital, he was able to offer much practical experience. In early December 1839 he set off in search of a run in the Western District and visited a number of stations. Impressed with the Scottish-like countryside, Black arrived at Strathdownie and decided to purchase the property. He kept a journal detailing his new life in Australia (now held by the State Library of Victoria) which provides details about his early experiences at this place which was named 'Glenormiston'. In 1843, Black returned briefly to Scotland to report progress and renew the partnership. On his return the following year he purchased the nearby run known as The Sisters and in 1845 bought the run Warreanga on the South Australian border. Many other extensive Western District properties were also acquired by the partnership and were held for various periods of time. During Black's early ownership of Glenormiston in the 1840s, wool production was the primary business with the wool transported to England for sale. Sheep were also raised for meat, for example in April 1852 two thousand fat sheep were advertised for sale. Cattle production, for both beef and dairy purposes, grew in importance during this period. In 1841 Black established a Shorthorn herd, which would later be described as 'unsurpassed in Australia'. Black kept horses and as early as 1846 was advertising the availability of two stallions for breeding purposes. In addition some crops were grown during the 1840s including oats, potatoes and wheat, and to a lesser extent tobacco. The Glenormiston homestead was one of the finest in the district and in December 1867 hosted the first royal visit to Australia. Prince Alfred, Duke of Edinburgh, was a guest at Glenormiston during this visit and an engraving of this event was undertaken to record this special occasion [Illustrated Australian News, 4 February 1868]. Black was a member of the Legislative Council from 1859 until his death. He died at Mt Noorat in May 1880 after a severe illness and left an estate of £179,208.46. In 1868-69 the partnership of Niel Black and Company was dissolved, and the holdings distributed by lot. Partner Alexander Finlay came into possession of the northern portion of the Glenormiston run which included the homestead. It is not known whether Finlay himself ever took up residence at Glenormiston (he died in Scotland in 1886), however his two sons, Alexander Finlay and Colin Finlay, did live there. Alexander Finlay was popularly known as an owner and breeder of thoroughbred racehorses, and was one of the leading racing men in the country. An 1873 newspaper article noted that he had a strong stud of valuable mares at Glenormiston. The following year he advertised six young horses for sale, varying in price between 90 and 400 guineas. Some years later in 1886, following his death, the whole of the Glenormiston stud of thoroughbred horses, including three stallions, brood mares and yearlings, was sold. In 1888, it was reported that there were about 25,000 sheep shorn annually at Glenormiston. At this time cattle were also kept with 800 being sent to market each year, and a considerable number of horses were kept for farm use and for breeding. The whole of the livestock was sold in early 1889, just prior to the sale of Glenormiston itself. In 1889, Colin Finlay sold Glenormiston and it was subdivided into 240 lots, varying in size from 1.4 hectares to 140 hectares. The homestead, and associated land, was classed as a separate lot. The auction was held in January 1889 with another auction held later that year for the remaining lots. Steuart G Black, the second son of Niel Black, privately purchased the homestead and 708 hectares. 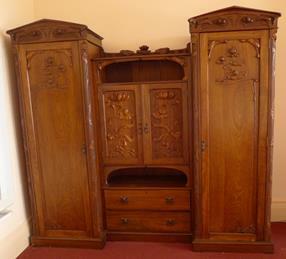 He was born at Glenormiston in 1862 and returned to the property when he purchased it 27 years later. Black leased much of the property and in 1909 there were eleven tenant farmers. The main agricultural activities were dairying and mixed farming. 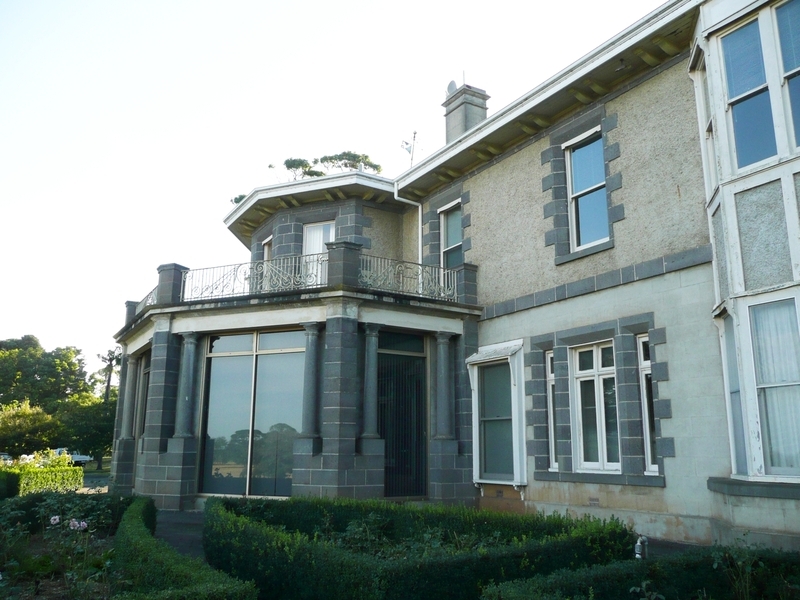 Steuart Black and his second wife Isabella were aspiring members of the Western District community as shown by the purchase of a motor car in 1906 and the fashionable alterations made to the Glenormiston homestead by Melbourne architects Sydney Smith and Ogg in 1908. Black was President of the Shire of Hampden when he hosted the second royal visit to Glenormiston, that of His Royal Highness the Prince of Wales (later King Edward VIII) in 1920. He was actively involved in local public affairs, and his obituary notes he was 'always a supporter of all things for the betterment of the district'. He was a member of the Mortlake and Hampden Shire Councils, and a trustee of both the Noorat and Terang Presbyterian churches. In 1902 Black hosted a picnic for the Noorat State School at Glenormiston which was attended by some 500 people. Following World War I, he contributed to the establishment of a memorial in Terang. Black died in 1940 after a number of years of ill health. Niel Black undertook a number of building works at Glenormiston in the 1840s. These included construction of bridges, a granary, milking yard, windmill and stable by 1842, a piggery in 1843, a bark covered 'cart shade' in 1844, an overseer's house in 1845, a hut in 1846, and several portable huts for use at the outstations in 1847-48. Black had a five-roomed stone house constructed in 1847 for £300, which consisted of a sitting room, three bedrooms and one small closet. It is likely that some parts of this house remain within the much enlarged extant building. Tenders were invited in February 1859 by Melbourne architects Austin & Co for 'extensive additions, consisting of upwards of 20 rooms' to the homestead at Glenormiston and a photograph taken shortly after construction shows this newly enlarged homestead with stone stables and coach house (both demolished in 1969) at the rear. 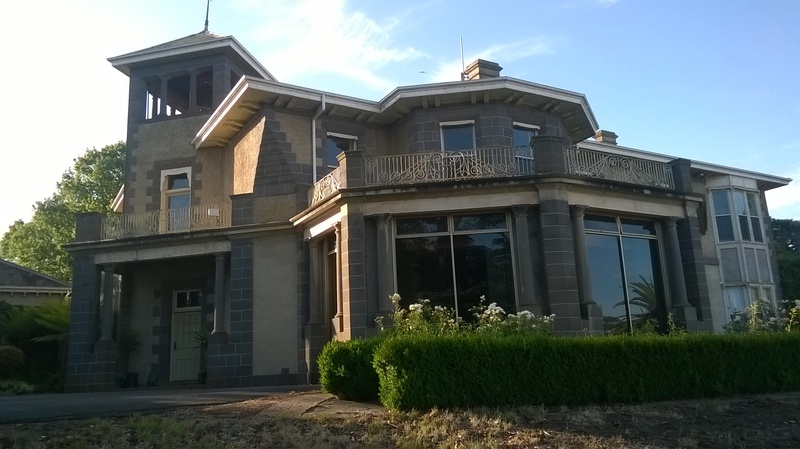 The homestead at Glenormiston was one of the finest in the area and in December 1867, during the first royal visit to Australia, Prince Alfred, Duke of Edinburgh, was a guest there. In 1876 architect Alexander Hamilton was engaged to design some new buildings including a shed, and an eight-roomed stone overseer's cottage. Additions were made to the homestead at some stage in the late nineteenth century, including a dining room wing, additional maid accommodation and service rooms and a detached masonry outbuilding at the rear of the homestead. No changes were made to the front of the building at this time. Significant alterations and additions were made to Glenormiston homestead in 1908 to the design of Melbourne architects Sydney Smith & Ogg. A second storey and nursery wing were added and the drawing room extended, effectively doubling the size of the house. The existing entrance was replaced with an entrance and corner tower and a verandah with an upper terrace was constructed. Similar materials were used but the Italianate style exterior was redesigned in a contemporary Arts and Crafts style. Sections of the interior were decorated in an Arts and Crafts manner and completed primarily under the direction of Black's wife Isabella. Isabella commissioned the furniture maker and wood carver Robert Prenzel to produce a decorative staircase as well as a fine suite of furniture for the enlarged house. This commission remained one of his most ambitious works. A one acre vegetable garden had already been established at the Strathdownie, later Glenormiston, property when Black purchased it in 1840. In June 1845, Black purchased a large number of fruit trees and vines so it is likely that an orchard was established at Glenormiston at this time. The garden during Black's period of ownership reflected a desire to create a Scottish landscape, with various exotic plantings. As indicated in illustrations from the 1860s, a number of native trees were retained around the house and a semicircular driveway was formed to allow carriages to drive to the front of the house. An engraving from 1868 shows a ha-ha, or retaining wall, to the east of the homestead and some plantings to the north of the homestead. In 1888 a journalist visiting the site described the 'glorious view' to the east and south from the terrace in front of the homestead as 'an extensive plain of such splendidly fertile land as is seldom seen even in the Western District' and the view to the west and north as 'bounded by a large plantation of conifers and other foreign trees'. Particular mention was made of a 'very fine specimen of the Cedrus atlantica' and it was observed that 'the face of the country has been so altered as scarcely to be recognised by one who was acquainted with it of old' having previously featured areas of dense forest and swamps. Colin Finlay (owner of Glenormiston 1869-1889) was said to have been a great lover of forest trees who 'endeavoured to get every beautiful forest tree that would thrive in that soil and climate' and 'displayed great taste in grouping the various specimens so as to display them to the greatest advantage'. 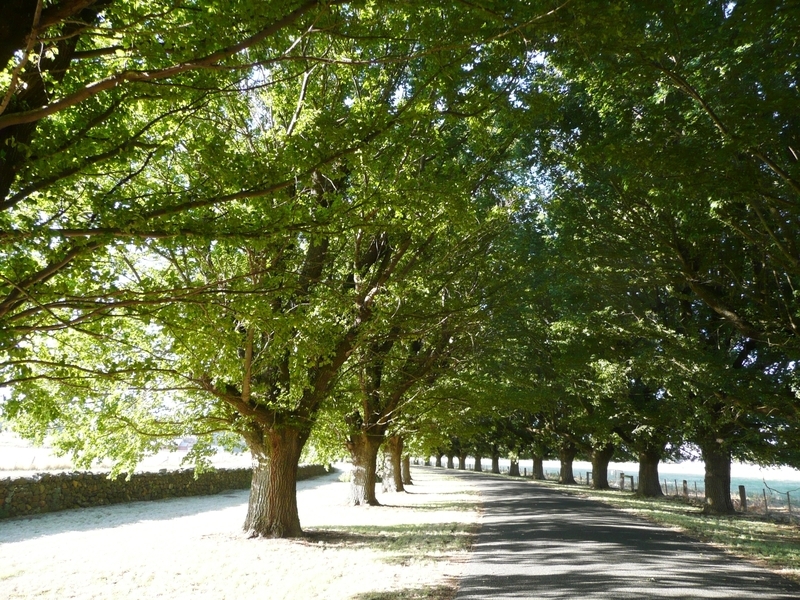 He was also 'liberal in giving young trees to all who wanted them', a notable example being the double row of English Elms in the main street of Camperdown (VHR H0647), gifted by the Finlay family in 1876. Where the avenue runs across a field, Mr C C Finlay . has adopted an excellent plan for keeping the horses from barking the elms. This consists of having a spiral of barbed wire round the tree of sufficient width to allow of fully 10 years growth.. The avenue leads for some distance along the foot of a stony bank, and it is curious to notice how marked is the difference of growth in the trees on either hand. In the rich deep soil of the flat the elms have made remarkably fast growth, their stems being often 20in. in diameter. On the edge of the bank, not a dozen yards away, the trees, though perfectly healthy, have stems not above 6in. in diameter. Like the Finlays, both Steuart and Isabella Black enjoyed gardening, and continued to enhance the beauty of the landscape at Glenormiston. They personally sourced rare plants, new species and hybrids unavailable in Australia on their travels abroad. During their ownership, the garden was described as having exotic trees, an orchard, vegetable and flower gardens, lawns, summer houses and pagodas. The Blacks introduced a wide palette of infill planting amongst the older trees to the south and east of the house, including a Chinese Elm, variegated Japanese Maples and Weeping Cherry. Planting on the northern embankment included a Variegated Chinese Elm, Robinia, Schinus and Sorbusspp. Large garden beds were densely planted. That to the north spreads out across a level croquet lawn, then falls away in terraces to an extensive garden spreading out in formal lines on the flat lands, and bounded in the distance by a magnificent collection of coniferous trees, ashes, elms, poplars, oaks and other trees.
. the view to the east lies open along the entire length of the house. 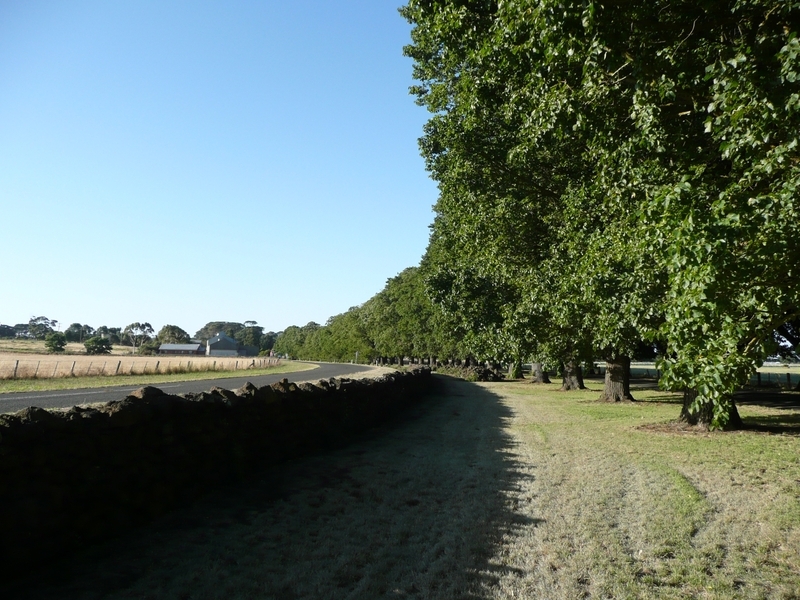 The abrupt fall in the land on this side forms a natural transition from the garden to the flat park lands where choice and rare trees have been planted in the near distance, merging into eucalypts, set amid rich pastoral meadows in the farther distance. On the east side of the house roses were grown in beds of separate varieties and along the entrance drive were a group of magnolias, among them a rare Magnolia campbelliia native of the Himalayas. Herbaceous and hardy garden flowers were grown in long, open beds in the outer areas of the garden and contained herbaceous peonies, delphiniums, Canterbury bells, Lilium regale and L Henryl and Cytisus hybrids. Among the trees planted near the house, were three 'unusually fine specimens of the upright cypress' growing to 40 feet in height, a 'magnificent specimen of Cedrus Atlantica glauca', a number of Ginkgo biloba on the lower flats, and a Paulownia imperialis, a flowering tree from Japan. In 1984 the gardens were renovated and in the ensuing years over one hundred exotic trees and shrubs were planted, with an emphasis on unusual species, as well as Australian natives. The gardens at Glenormiston served an educational function for the students of the Glenormiston Agricultural College. The famous Glenormiston butter factory is situated close to the gate leading into the Glenormiston Estate. This factory turns out one of the best brands of Victorian butter at an average rate, during December, of about 3 tons per day. The factory itself is an up-to-date establishment. It is built of bluestone, which, besides being solid, keeps remarkably cool in summer. The Glenormiston Butter and Cheese Factory was transferred to new premises at Noorat in 1910. In 1910, a new company called Trufood of Australia took over the butter and cheese factory site at Glenormiston for the purpose of manufacturing powdered milk, thus pioneering the industry in Australia. The Glenormiston Butter and Cheese Factory, relocated to Noorat, supplied milk to this factory for processing. The company had acquired the patent rights for the Merrell Soule process of drying milk through the English company Trufood Engand. A large financial interest was taken by the Black family. A new part concrete factory was built, probably modelled on the English Trufood factory at Wrenbury. As a secondary industry, the Trufood factory contributed considerably to the diversity of commerce in the local area. In the 1920s and 1930s the company was at the height of its prosperity. During World War II, large quantities of Trufood products were supplied to the British, American and Australian armies and navies. In 1950, the company had 300 shareholders spread throughout the Commonwealth, and was the only major industrial organisation operating in the district. The Glenormiston Cheese and Butter Factory, in conjunction with the Camperdown Cheese and Butter Factory, took over Trufood in 1959 and production continued until closure of the factory in 1974. Establishment of an agricultural college and research centre at Glenormiston was first proposed by the Terang Postwar Planning Committee in 1946. This committee considered that such an institution would cater for the requirements of the south western district and provide an opportunity for the training of soldier settlers. 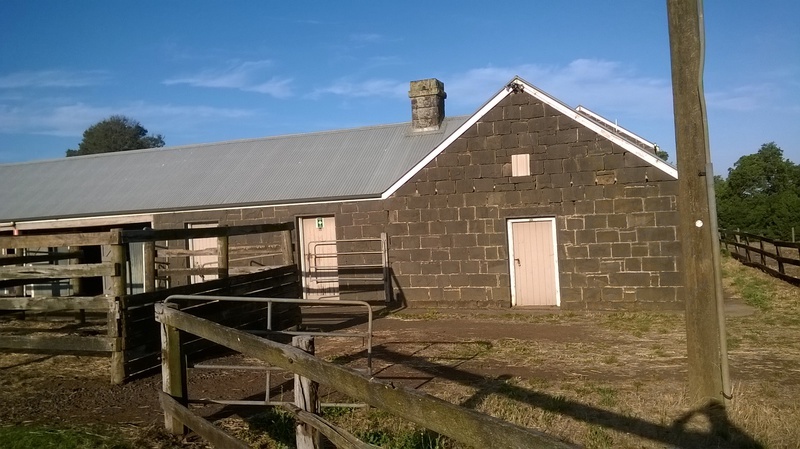 In addition to the Glenormiston homestead, there were nine residences at the property suitable for staff accommodation, and a number of outbuildings and stables. It was estimated at the time that the existing facilities were sufficient for the immediate billeting and training of 200 ex-soldiers. In 1949 the homestead and 280 hectares was purchased by the Department of Agriculture, and the remaining land was sold as farms. The department's intention was to establish an agricultural research and education centre, primarily concerned with the needs of the dairy industry, however the operation of a college was delayed due to limited funds and a shortage of building materials and trained staff. For several years the only activity undertaken at Glenormiston was research on pastures, plant breeding and beef and vegetable production. The first farm supervisor, Noel Young, was appointed in 1952, and he resided in the former overseer's cottage. The intention to develop Glenormiston into an agricultural college was announced in 1967. It was proposed that the college would serve the rural community by training young men and women, already experienced in farming, in the principles and practices of farm management. It was to be the first college in the state established specifically with a co-educational remit. R G Luff was appointed the first principal of the college in 1969, and he was responsible for the development of course material, the appointment of staff and the development of a building program. The transformation of the site into a college was undertaken in stages, with the bulk of work undertaken from 1969 to 1973, at a cost of approximately $2,250,000. To enable construction of campus buildings, a number of outbuildings were demolished however the majority of established trees were retained. Demolished buildings included: a stone coach house and stables, a two storey stone servant's quarters attached to the south of the coach house, a later stone stable building, a two storey bluestone shearer's quarters building, a weatherboard house and various galvanised iron and weatherboard sheds. 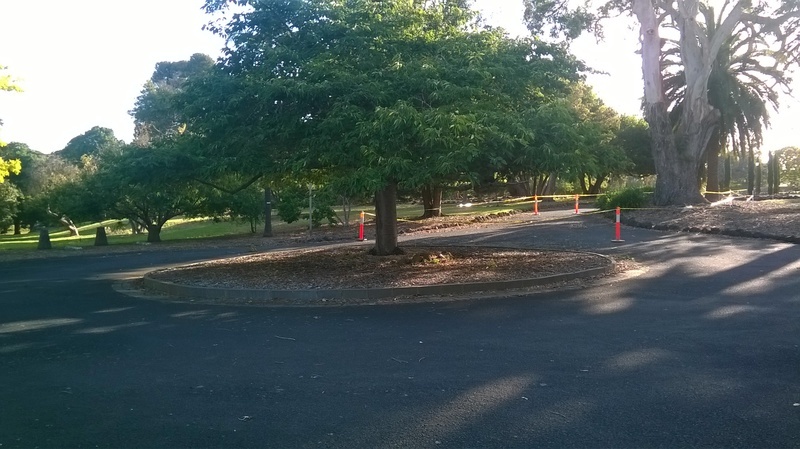 At this time three buildings were relocated to the south of the site as part of a group of established horticultural buildings established c1950s. In 1969 a new farm building complex, consisting of various sheds, was constructed and a new road system established. 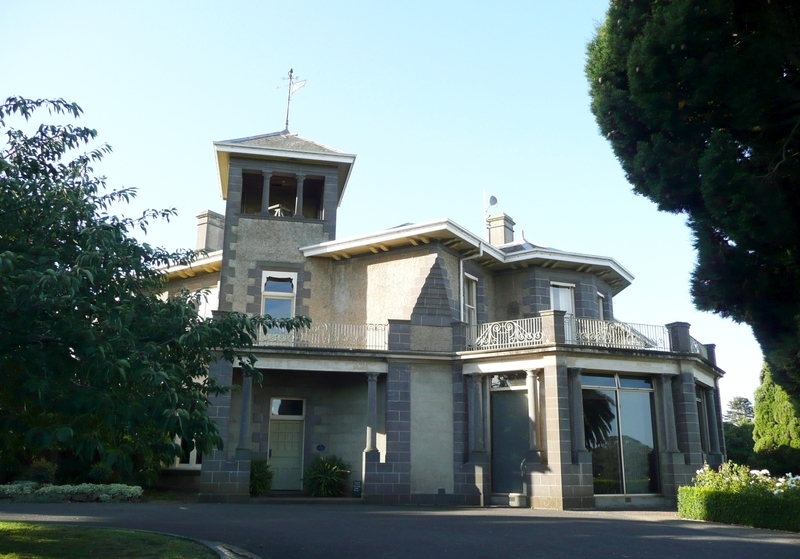 The following year the homestead was converted to offices, a library, tutorial rooms, staff accommodation, facilities and conference room. A sunroom extension to the rear of the homestead, leading out from the former kitchen, was also completed at this time. College buildings were designed by Desmond Bloink of the Public Works Department, under Chief Architect D C Bradbury, and construction took place in two stages. Stage one (1970-71) consisted of a Laboratory and teaching block, two dormitory blocks, an amenities block and a principal's residence. Stage two (1971-72) consisted of two additional dormitory blocks, a multipurpose hall, an agricultural engineering block and a sports pavilion. The college was officially opened on 6 April 1973 by the Premier of Victoria, R J Hamer, though further work took place during the following years. This included a demonstration dairy and squash court in 1974 and a swimming pool in 1976. Another major phase of activity at the site occurred during the 1990s and included the construction of an indoor equestrian centre in 1993, a group of dairy sheds on Wallace's Lane to the east, and 'Mullebar' Koorie Centre in c1998. The first intake of students for the two year diploma course in farm management was in March 1971. In the ensuing years residential short courses, and evening part-time and correspondence courses were also offered. In 1983, the Victorian College of Agriculture and Horticulture (VCAH) was established to manage the campuses of Glenormiston, Dookie, Longerenong, Burnley, McMillan and Gilbert Chandler. In 1995 the VCAH and the University of Melbourne amalgamated and from 2006 until early 2014, South West TAFE managed the college. The college was closed in 2014 following a drop in demand for residential and on-site training at Glenormiston. It should be noted that Permit Exemptions can be granted at the time of registration (under s.42(4) of the Heritage Act). Permit Exemptions can also be applied for and granted after registration (under s.66 of the Heritage Act).
. Removal of non-original items services and fixtures such as air conditioners, pipe work, ducting, wiring, antennae, aerials etc. and making good in a manner not detrimental to the cultural heritage significance of the place.
. Installation of new external fixtures and fittings such as hot water services and taps in a manner not detrimental to the cultural heritage significance of the place (that is, have limited, if any, intervention into significant fabric or obstruct views to it).
. Painting of previously painted walls and ceilings provided that preparation or painting does not remove evidence of any original paint or other decorative scheme (no stained timberwork is to be painted).
. Installation, removal or replacement of non-original carpets and/or flexible floor coverings.
. Installation, removal or replacement of non-original curtain tracks, rods and blinds.
. Installation, removal or replacement of hooks, nails and other devices for the hanging of mirrors, paintings and other wall mounted art.
. Demolition or removal of non-original stud/partition walls, suspended ceilings or non-original wall linings, non-original doors, aluminium-framed windows, bathroom and kitchen fit-outs, lights (excepting the decorative light fittings in the hall of the homestead).
. Installation of removable stud walls provided that installation does not damage/remove original fabric.
. Refurbishment of existing bathrooms, toilets and kitchens including removal, installation or replacement of non-original sanitary fixtures and associated piping, mirrors, wall and floor coverings.
. 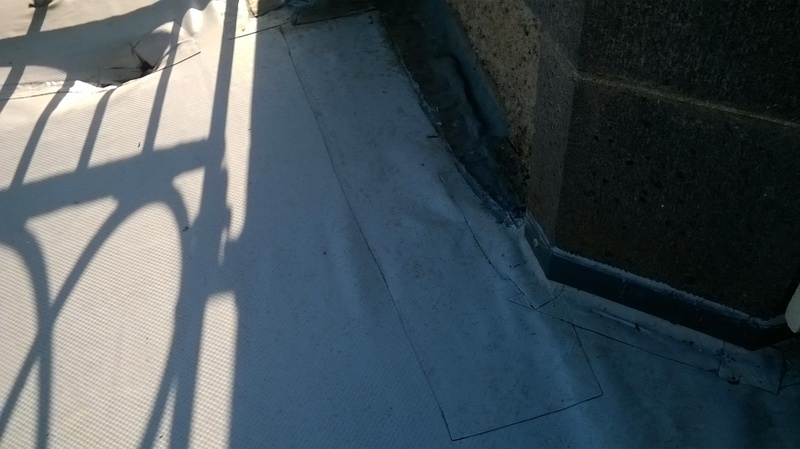 Removal of tiling or concrete slabs in wet areas provided there is no damage to or alteration of original structure or fabric.
. Installation, removal or replacement of non-original ducted hydronic heating provided that the installation does not damage existing skirtings and architraves and that the central plant is concealed, and is done in a manner not detrimental to the cultural heritage significance of the place.
. Installation, removal or replacement of electrical wiring provided that all new wiring is fully concealed and any original light switches, pull cords, push buttons or power outlets are retained in-situ. Note: if wiring original to the place was carried in timber conduits then the conduits should remain in situ.
. Installation of plant within the roof space.
. 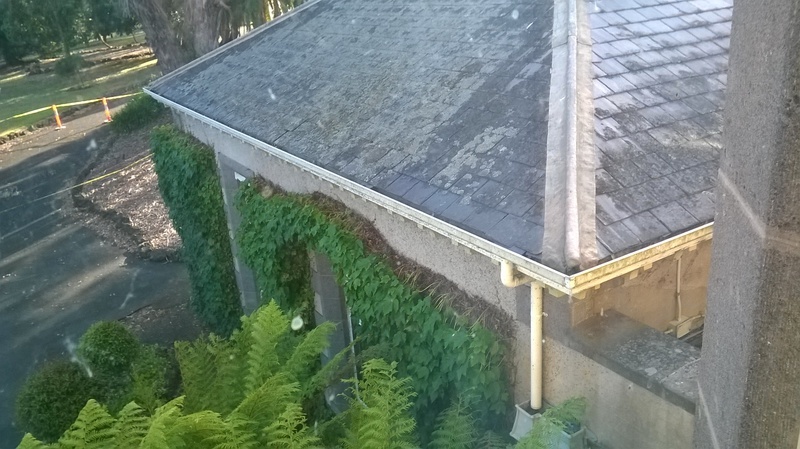 External alterations to the outbuildings where sympathetic materials are used or where additions are readily removable.
. Minor repairs and maintenance which replace like with like to the exterior of the college buildings. This permit exemption applies to the 1960s shearing and holding sheds in the vicinity of the Gnurad Gundidj Campus.
. Internal alterations as necessary to all interiors other than the dormitory areas of the college buildings.
. Refurbishment of the dormitory areas of the college buildings including changes to the plan, which retain indications (eg. nib walls) of the original plan.
. Refurbishment of existing bathrooms, toilets and kitchens including removal, installation or replacement of sanitary fixtures and associated piping, mirrors, wall and floor coverings.
. Works to buildings that do not increase the footprint of the building.
. Relocation that does not affect significant buildings.
. The process of gardening, including mowing, hedge clipping, bedding displays, removal of dead shrubs and replanting the same species or cultivar, disease and weed control, and maintenance to care for existing plants.
. Repairs, conservation, and maintenance to hard landscape elements, such as driveways, stone walls, steps, paths, gutters, drainage and irrigation systems, edging, fences and gates, pool, and tennis court in a manner which preserves the cultural heritage significance of the place.
. Removal of dead or dangerous trees and emergency works to maintain safety and to protect buildings and structures, provided a report detailing the works undertaken is submitted to the Executive Director within 21 days of the works occurring.
. Replanting removed or dead trees and vegetation with the same plant species to conserve the significant landscape character and values.
. Subsurface works involving the installation, removal or replacement of watering and drainage systems or services, outside the canopy edge of significant trees in accordance with AS4970 and on the condition that works do not impact on archaeological features or deposits.
. All works to the buildings and land of the Gnurad Gundidj Campus. Works affecting the remnant rows of cypresses near the Gnurad Gundidj Campus are not exempted. 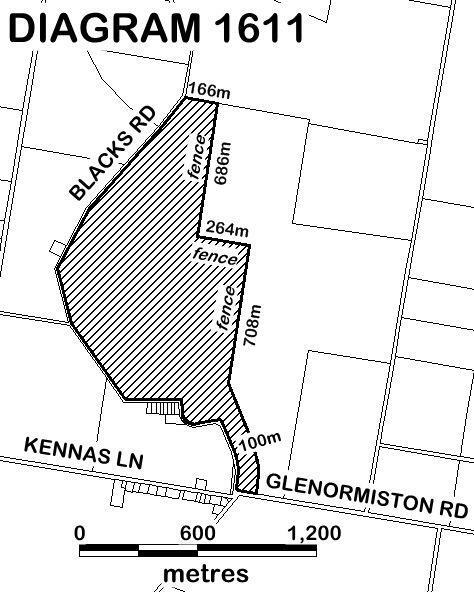 The extent of registration of the Glenormiston (Homestead and Former Agricultural College) on the Victorian Heritage Register affects the whole place shown on Diagram 1611 including the land, all buildings, roads, trees, landscape elements and other features. Under the Heritage Act 1995 a person must not remove or demolish, damage or despoil, develop or alter or excavate, relocate or disturb the position of any part of a registered place or object without approval. It is acknowledged, however, that alterations and other works may be required to keep places and objects in good repair and adapt them for use into the future. A Conservation Management Plan has been developed for this place by RBA Architects + Conservation Consultants (2015). It is strongly recommended that any works and activities are guided by this CMP. The following section identifies buildings and features of the place and attributes a level of cultural heritage significance to them within the context of the place. The buildings and structures are identified by the numbers used in the RBA Architects + Conservation, Conservation Management Plan (2015).
. Former Trufood factory (Sd) and brick classroom.
. Drystone walling by students, teachers and others.
. Buildings in the other groups - wash down bay in cattle group (Jc); storage shed (Xc); two sheds in the horticultural group, (Ya+ Yf).
. Tank to the north of homestead (recently constructed corrugated sheet metal tank). Archaeological: Ground disturbance may affect the archaeological significance of the place and, subject to the exemptions stated in this document, requires a permit.